Transom windows are common in homes with high ceilings and are very common all over Colorado. You might have one in your high ceiling area, in your stairwells, or even in a bedroom. These windows are usually set up higher than your standard windows and tend to be a little smaller because they take on more decorative shapes. If you have a transom window in your home with clear glass, perhaps it is time to think about installing stained glass to create a unique and connected style throughout your home. Since transom windows always provide great light they are a valuable asset to your home but don’t always add much aesthetic value to a room. Adding stained glass can make your transom a beautiful focal point of any room or a subtle addition that ties in seamlessly with your décor. If you live in a newer neighborhood in Denver, your house may be very close to other homes in the area, which makes for privacy issues. Adding a stained glass transom can give you the privacy you need while still letting the natural light into your home. 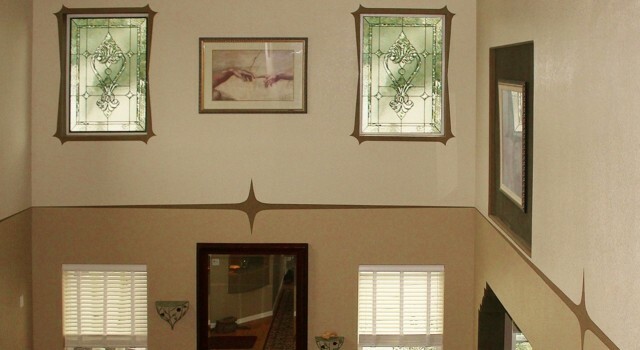 Stained glass transom windows are truly where form seamless meets function! When it comes to adding high quality, custom stained glass windows to your home, Denver Stained Glass is Colorado’s industry leader. We also pride ourselves in our customer service, from your initial consultation to your time with your designer until the final installer leaves your house, you will notice our courtesy and attention to detail. We have over 25 years of experience and know what it takes to be the best in the biz. Contact us today about a custom transom for your home and a free in-home consultation.